In the field of engineering, a licensed engineer will have to guarantee the quality of his work. Why is it that in the field of medicine, the doctor is not required to guarantee that his protocol or prescription works at all? 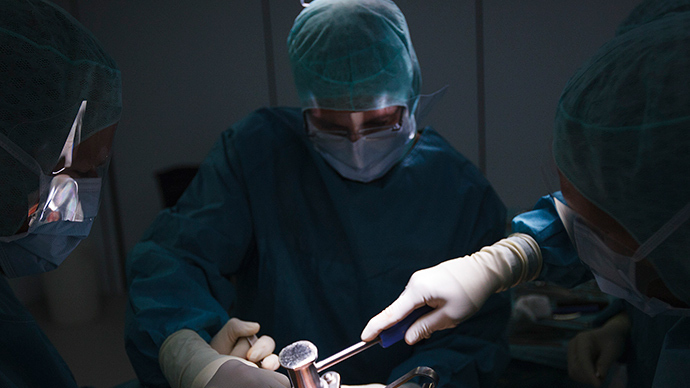 On the contrary, you’ll be made to sign a waiver that absolves them from any liabilities arising from the trial and error nature of their prescriptions and invasive surgery. “Is it approved by the authorities?” Do the treatments have undergone the required clinical trials? Is it peer-reviewed? 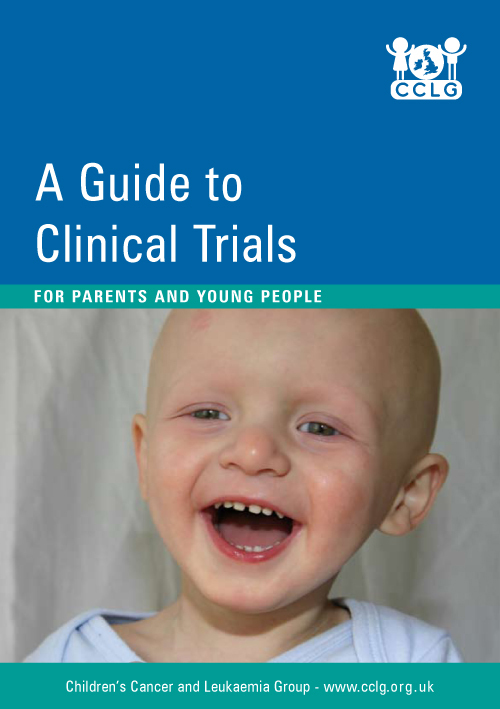 It turns out these clinical trials can be manipulated; peer reviews can be influenced through indirect bribery, i.e. 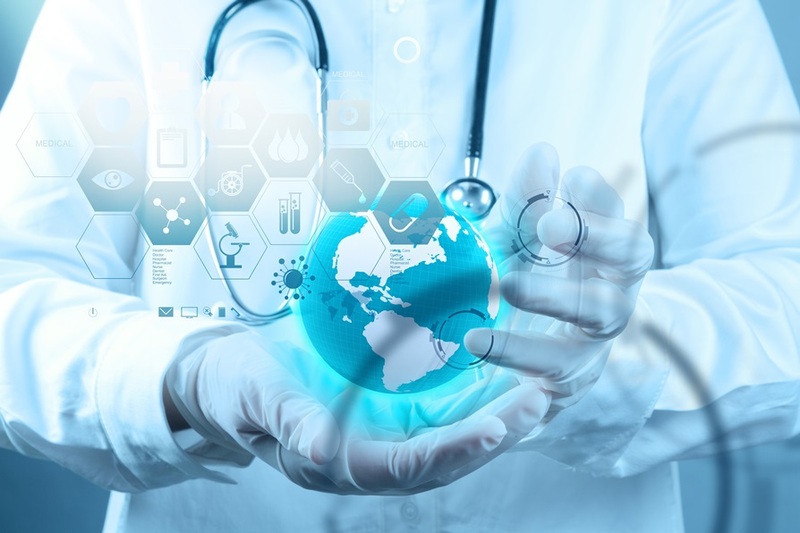 paid vacations, sponsored medical conventions, and; regulatory approvals are almost assured all the time as the executives of the pharmaceutical industries have worked or are soon to be appointed into government regulating bodies task of oversight on drug safety. They call it ‘revolving door’ policy. All medical drugs are approved safe until proven profitable and deadly. All alternative treatments are considered harmful until proven safe by peer reviewers, i.e. its detractors. So, can we trust these companies who are after huge profits at the least cost possible? Should we believe that drugs can cure even if that means reduced revenues for the manufacturers in the long run? The reality is simple: drug companies earn more by keeping you alive and sick for as long as can be made possible, and the only way to do that is to make you a drug addict, and the doctors, drug pushers. 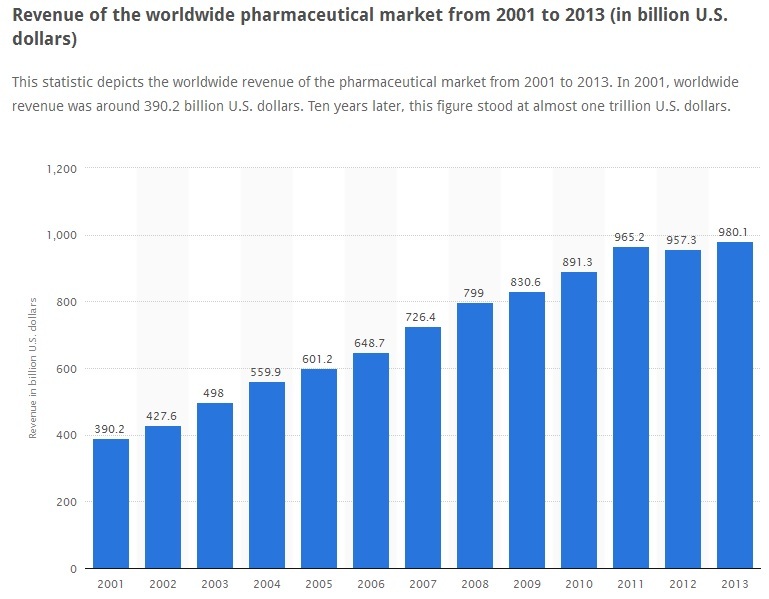 The total income for Big Pharma for 2001 to 2013 period amounts to $980 billion. 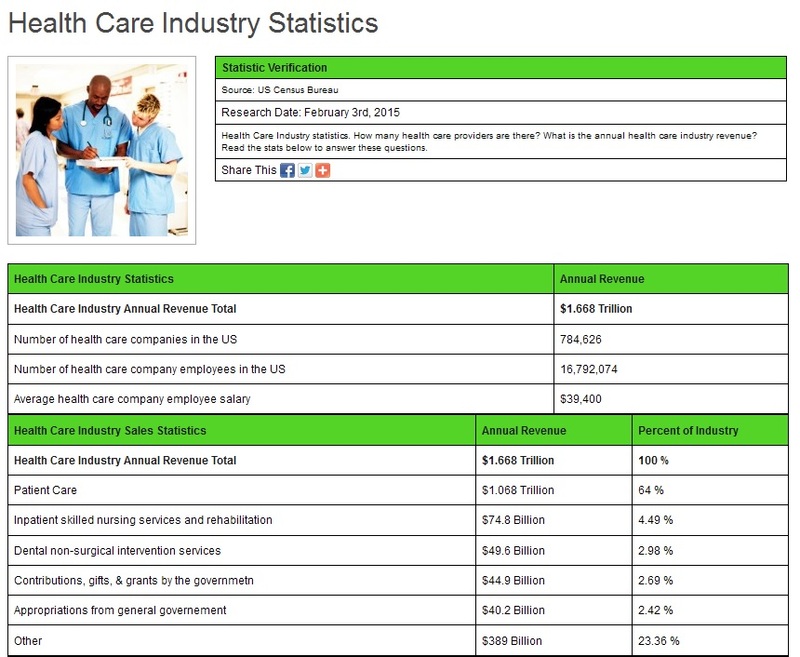 The total medical industry revenue in 2015 alone is a whopping $1.668 trillion! Everybody working in the system is well compensated and so they all tend to protect it. But who will protect us, if the government regulators are in bed with them? No. But I got cured, so what’s your problem? Do your drugs work? How many have you sliced and poisoned today? How many will die of your prescriptions tomorrow? The use of chemicals in defeating diseases goes back to medieval times, i.e. back to the time of the alchemists. So who’s actually doing quackery here? The only modern in Modern Medicine is not the methods but the multi-level sophistication of its marketing presentation. Taking just 25 percent more than the daily recommended dose of acetaminophen—the equivalent of just two extra strength pills per day—can cause liver damage after just a couple of weeks of daily use,6 and acetaminophen poisoning accounts for nearly half of all acute liver failure cases in the US. These drugs do have a place in medicine. However, it’s quite clear that they’re being overprescribed, and can easily lead you into addiction and other, more illicit drug use. I strongly suspect that the overreliance on them as a first line of defense for pain is a major part of our current drug abuse problem. On January 12, the US Centers for Disease Control and Prevention (CDC) released its 2013 Drug Overdose Mortality Data,7 which shows no improvement in mortality rates associated with prescription opioids, which ranks number one in terms of drug overdose deaths. Ditto for Dr. Sanjay Gupta, chief medical correspondent at CNN, who explains the rise in heroin addiction by linking it to dependence on prescription opioids.9 Indeed, what many fail to realize is that opioid prescription painkillers are very similar to heroin. “Doctors have been less willing to prescribe medications, especially in states like Florida, formerly known for its pill mills, where tighter restrictions on prescribers led to a 23 percent drop in overdose deaths between 2010 and 2012. The drugs themselves have been tweaked as well. In August 2010, an abuse deterrent version of Oxycontin was released to great fanfare. It was reformulated so it could not as easily be crushed or solubilized so abusers would have a difficult time injecting or snorting it. Opioids and heroin bind to the same receptors in your brain and produce identical results, including an increased threshold for pain and euphoria. On the downside, they produce drowsiness, and at higher doses can slow your breathing, which can turn into a lethal event. They’re also equally potent in their ability to cause addiction. Interestingly, research published last year suggests that medical cannabis may be a safer alternative for people with chronic pain. Dr. Gupta discusses these findings in the featured video. Marijuana led to a 25 percent drop in deaths from painkiller overdoses, which is a fairly significant reduction. Many suffering from chronic pain end up using painkillers for years on end, yet there are no studies longer than one year on record. Most trials do not go past six weeks. There’s also a lack of standardized trials evaluating the side effects of opioid use, which is the “golden standard” of medical science-based evidence. Investigations by the Milwaukee Journal Sentinel and MedPage Today have documented the lack of evidence supporting use of narcotic painkillers for chronic, non-cancer pain. I addressed this issue in July last year, when the US Food and Drug Administration (FDA) approved yet another narcotic painkiller, Zohydro ER (Zogenix). The drug, which is the first drug containing pure hydrocodone (synthetic heroin), was approved at the same time that the FDA was also recommending tighter controls on narcotic painkillers, in light of alarming addiction rates and deaths linked to accidental overdoses. All other hydrocodone-containing painkillers on the market are mixed with other non-addictive ingredients. Zohydro ER was approved for patients who need around-the-clock pain relief, and contains an opioid dose that is five to 10 times greater than anything else on the market. Are Conflicts of Interest Driving Addiction Rates? When FDA Commissioner Margaret Hamburg was criticized for the agency’s approval of Zohydro, she countered saying that “100 million Americans” suffer from severe chronic pain warranting use of the drug. This 100 million statistic has been tossed around in the media ever since.15 But this figure amounts to about 40 percent of the US adult population and, if true, would be an epidemic of staggering proportions. Alas, there are problems with this 100 million figure, which originated with a report created by the Institute of Medicine (IOM), titled: “Relieving Pain in America, A Blueprint for Transforming Prevention, Care, Education, and Research.”16This report warns against restricting the use of opioid drugs for the fact that so many people “need” them. Not surprisingly, nine of the 19 panel experts that produced this statistic were found to have undisclosed financial ties to companies that manufacture narcotic painkillers. Pain experts went on the record stating that the 100 million number was completely misleading, as the IOM defined “chronic pain” as pain lasting three to six months, regardless of the cause or severity. The 100 million figure includes not only those with chronic but manageable pain, but also those recovering from surgery or undergoing cancer treatment. According to the National Institutes of Health Pathways to Prevention Workshop paper17 that was just published, an estimated 25 million Americans have “moderate to severe chronic pain that limits activities and diminishes quality of life”—a much smaller number than the 100 million used to justify the approval of yet another, extremely potent narcotic pain reliever. Back pain is perhaps the most common form of chronic pain. An estimated 80 percent of Americans will suffer from back pain at some point in life, and an estimated 25-30 percent end up struggling with persistent or chronic back pain, leading many in search for relief in a pill. However, according to research18,19 published last year, taking acetaminophen for back pain is no more effective than taking a placebo! Another issue that is rising to the forefront is concerns about birth defects. As reported by Kaiser Health News,20 nearly one-third of American women of childbearing age are prescribed opioid painkillers such as Vicodin and Oxycontin, despite the fact that these drugs carry risks of birth defects and other pregnancy-related problems. Even more shocking, one recent study21,22 found that more than 14 percent of pregnant women were prescribed opioid drugs during their pregnancy. Back pain—a problem most pregnant women have to deal with—was the most commonly cited reason for the prescription. Narcotics were also prescribed for complaints of abdominal pains, migraine, joint pains, and fibromyalgia. Clearly, if you are planning a pregnancy or are pregnant, you should go to great lengths to avoid narcotic drugs. Many of the non-drug alternatives listed below can be helpful for addressing pregnancy-related aches and pains. Last summer, US Attorney General Eric Holder announced his office is taking steps to address the mounting problem of opioid addiction. This effort includes but is not limited to tracking drug overdose trends, educating health care professionals and the public about prescription drug abuse, and promoting programs shown to prevent such abuse. With all the health risks associated with acetaminophen and opioid painkillers, you’d be wise to exhaust other options before resorting to these drugs. Below I list some of the most effective non-drug alternatives for the treatment of pain that I know of. If you’re in pain, I recommend trying these first, before even thinking about prescription painkillers of any kind. Medical cannabis Medical cannabis has a long history as a natural analgesic.24 At present, 20 US states have legalized cannabis for medical purposes. Its medicinal qualities are due to high amounts (about 10-20 percent) of cannabidiol (CBD), medicinal terpenes, and flavonoids. As discussed in this previous article, varieties of cannabis exist that are very low in tetrahydrocannabinol (THC)—the psychoactive component of marijuana that makes you feel “stoned”—and high in medicinal CBD.The Journal of Pain,25 a publication by the American Pain Society, has a long list of studies on the pain-relieving effects of cannabis and would certainly seem worth the effort for anyone with chronic pain to utilize.Just be sure to seek out a knowledgeable cannabis physician, as many have no idea of the proper dosing. If you are seriously considering medical cannabis for pain, it is imperative that you view my interview with Dr. Alan Frankel, who is one of the leading medical cannabis physicians in the US. He can do consultations on the phone if one needs specific questions answered. Eliminate or radically reduce processed foods Avoiding processed grains and refined sugars (particularly fructose) will lower your insulin and leptin levels and decrease insulin and leptin resistance, which is one of the most important reasons why inflammatory prostaglandins are produced. That is why stopping sugar and sweets is so important to controlling your pain and other types of chronic illnesses. Emotional Freedom Techniques (EFT) EFT is a drug-free approach for pain management of all kinds. It borrows from the principles of acupuncture, in that it helps you balance out your subtle energy system. It helps resolve underlying, often subconscious, negative emotions that may be exacerbating your physical pain. By stimulating (tapping) well-established acupuncture points with your fingertips, you rebalance your energy system, which tends to dissipate pain. K-Laser Class 4 Laser Therapy K-Laser therapy can be an excellent choice for many painful conditions, including acute injuries. By addressing the underlying cause of the pain, you will no longer need to rely on painkillers. K-Laser is a class 4 infrared laser therapy treatment that helps reduce pain, reduce inflammation, and enhance tissue healing—both in hard and soft tissues, including muscles, ligaments, or even bones.The infrared wavelengths used in the K-Laser allow for targeting specific areas of your body, and can penetrate deeply into the body to reach areas such as your spine and hip. For more information about this groundbreaking technology, and how it can help heal chronic pain, please listen to my previous interview with Dr. Harrington. Avoid sitting down One of the most common causes of pain is low back pain. Even I struggled with it for many years. The only thing that eliminated it, yes entirely 100% gone, was radically reducing the number of hours of sitting from 15 hours a day to less than one. Chiropractic Many studies have confirmed that chiropractic management is much safer and less expensive than allopathic medical treatments, especially when used for back pain. Qualified chiropractic, osteopathic, and naturopathic physicians are reliable, as they have received extensive training in the management of musculoskeletal disorders during their course of graduate healthcare training, which lasts between four to six years. These health experts have comprehensive training in musculoskeletal management. Acupuncture Research has discovered a “clear and robust” effect of acupuncture in the treatment of: back, neck, and shoulder pain, osteoarthritis, and headaches. Astaxanthin Astaxanthin is one of the most effective fat-soluble antioxidants known. It has very potent anti-inflammatory properties and in many cases works far more effectively than anti-inflammatory drugs. Higher doses are typically required and you may need 8 mg or more per day to achieve this benefit. Boswellia Also known as boswellin or “Indian frankincense,” this herb contains specific active anti-inflammatory ingredients. This is one of my personal favorites as I have seen it work well with many rheumatoid arthritis patients. Cetyl Myristoleate (CMO) This oil, found in fish and dairy butter, acts as a “joint lubricant” and an anti-inflammatory. I have used this for myself to relieve ganglion cysts and a mild annoying carpal tunnel syndrome that pops up when I type too much on non-ergonomic keyboards. I used a topical preparation for this. Evening Primrose, Black Currant and Borage Oils These contain the essential fatty acid gamma linolenic acid (GLA), which is useful for treating arthritic pain. Cayenne Cream Also called capsaicin cream, this spice comes from dried hot peppers. It alleviates pain by depleting the body’s supply of substance P, a chemical component of nerve cells that transmits pain signals to your brain. The silence is unbroken even when the FDA itself seems shocked at the degree of fraud and misconduct. 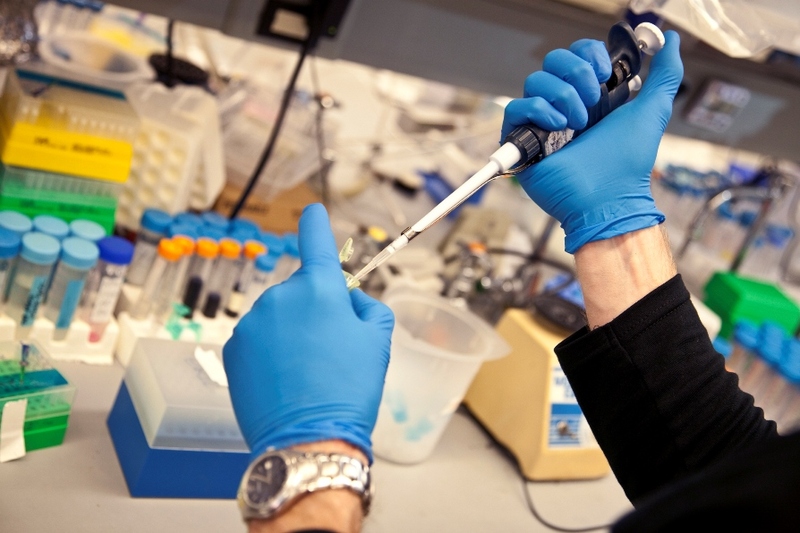 We didn’t have to search very hard to find FDA burying evidence of research misconduct. Just look at any document related to an FDA inspection. As part of the new drug application process, or, more rarely, when the agency gets a tipoff of wrongdoing, the FDA sends a bunch of inspectors out to clinical sites to make sure that everything is done by the book. When there are problems, the FDA generates a lot of paperwork—what are called form 483s, Establishment Inspection Reports, and in the worst cases, what are known as Warning Letters. 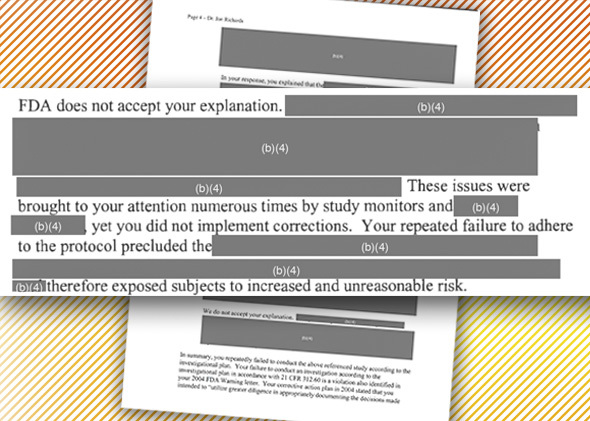 If you manage to get your hands on these documents, you’ll see that, most of the time, key portions are redacted: information that describes what drug the researcher was studying, the name of the study, and precisely how the misconduct affected the quality of the data are all blacked out. These redactions make it all but impossible to figure out which study is tainted. My students and I looked at FDA documents relating to roughly 600 clinical trials in which one of the researchers running the trial failed an FDA inspection. In only roughly 100 cases were we able to figure out which study, which drug, and which pharmaceutical company were involved. (We cracked a bunch of the redactions by cross-referencing the documents with clinical trials data, checking various other databases, and using carefully crafted Google searches.) For the other 500, the FDA was successfully able to shield the drugmaker (and the study sponsor) from public exposure. A redacted letter sent by the FDA to a clinical investigator in 2012.